We are excited to announce our last birth of the year. Peaceful Heart’s Christmas Snow was born on December 7, 2014, two months after we were expecting her. She arrived on a cold, but sunny day and has been wearing extra cria coats since her birth because it hasn’t warmed up since then. Due to our weather, we try to plan all our births for May and June in the spring and September and October in the fall. Alpacas are pregnant 10.5 to 11.5 months on average. 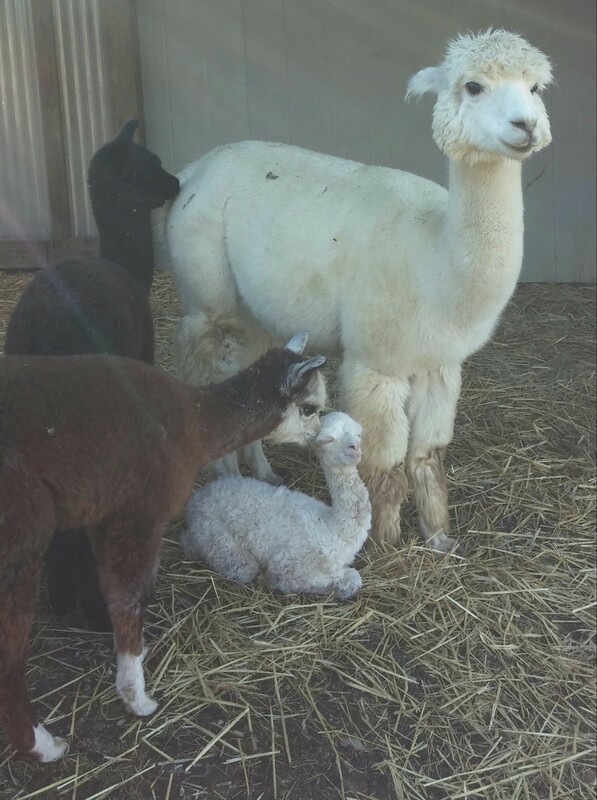 Generally, we rebreed the alpacas about 3 weeks after they give birth, and they have their crias about the same time each year. Individual girls tend to develop a pattern to their pregnancy length so that over time we can better predict when they will deliver. (For example, Ruthie’s 5 pregnancies have all been between 337 & 344 days, with 3 being exactly 344 days long.) Every once in a while, though, the alpacas don’t follow our schedule. Christmas Snow’s mother, Electric Snow, has had three crias previously. With those three crias (all from Lord Tennyson), Snow was pregnant 337 days, 334 days, and 330 days. 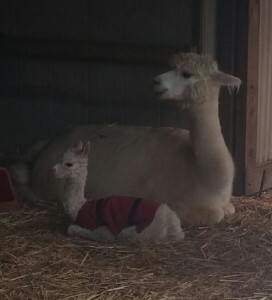 We assumed she would follow this pattern and expected her 2014 cria around the middle of October about the same time that MJ and Polar Night were born. 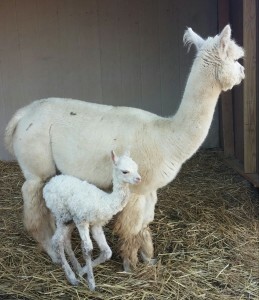 We were surprised when October passed with no cria from Electric Snow. November came, and then went, with no cria, and we started to wonder. We even had our vet out to do an ultrasound to confirm that Snow was actually pregnant. She was. And still we waited. We started joking that she was trying to break our farm pregnancy record of 393 days held by Bonnie when she was pregnant with her first cria Dubbie. Apparently we were right as our adorable little Christmas present arrived on Snow’s 396th day of her pregnancy. Christmas Snow, “Chrissy”, weighed 14.6 pounds and was soon on her feet running around despite the cold. We quickly weighed her and put a coat on her. One didn’t seem enough, so we added a second coat. Chrissy has a lovely, white coat of her own that reminds us a lot of her three full siblings, Timbuctoo, White Owl, and The Princess. We are so happy to to have her join our fall boys in time for Christmas. We invite you to come by the farm, visit the crias in the barn, and do some Christmas shopping. The farm is open daily through the end of the year. Two of our lovely alpaca girls have moved to their new farm. 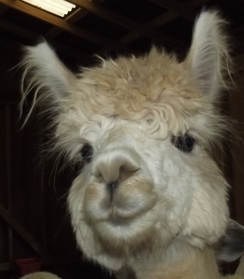 The Princess of Peaceful Heart and RC’s Guellermo’s Natalia joined the alpacas of Mackenzie’s Meadow Farm in November. The Princess is a daughter of our Lord Tennyson and granddaughter of our foundation herdsire Powergrid. She has a royal baby, white fleece (AFD 19.3) with beautiful crimp. Natalia was not born on our farm, but she is the mom of our adorable spring crias, Elsa. Natalia is 10 years of age with a fawn fleece that ranks in the top 5% of EPDs for staple length (2014). 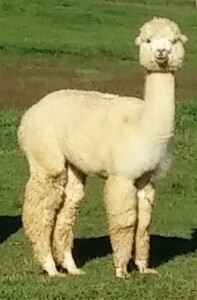 She has great genetics, and is bred to Lord Tennyson for a spring cria. We know they both will fit right into the herd at Mackenzie’s Meadow and be very happy there.